It's a Tea Party, hosted by Parsley and her daughter! I figured since the sun came out and I am a little blue today, it's a perfect time to have my spirits uplifted with a spot of tea. 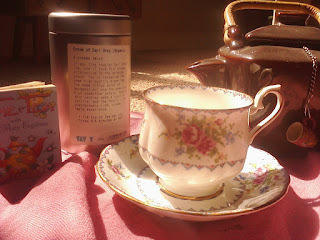 I picked Cream of Early Grey tea from David's Teas, pulled out my grandmother's Royal Albert tea cup that has the sweetest little cross stitched rose design. I didn't bake anything because I'm all by my lonesome and I'm not about to eat a dozen scones, biscuits or cookies on my own! 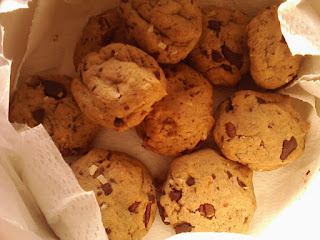 I will share with you my recipe for those vegan chocolate chip cookies that are delish!! 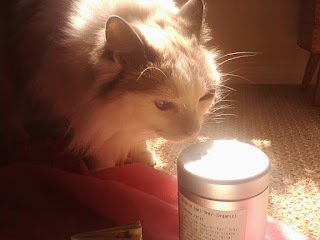 Titus joined my tea time too! I wore my laced Victorian gloves while sipping my tea. Mmmmmm!!! Oven at 350 and line a baking sheet with parchment paper. In a small bowl, make the egg replacer mix, set aside. With a mixer, beat the margarine until fluffy, add the brown and white sugar and beat for 1-2 mins until creamy. Beat in the egg replacer mix. Beat the remaining ingredients and fold in the chocolate chips, nuts, coconut. Shape balls of dough and place on baking sheet. Bake for 10-12 mins or up to 14 mins. Allow to cool for 5 mins on the sheet and then transfer to cooling rack. It says for crisper cookies, use the 1/2 margarine and 1 tbsp olive oil. I guess they spread out more with the oil. I hope you all have a wonderful day and enjoy your tea!!! Sorry to hear you are blue today Anne. Hope the tea and yummy looking cookies cheer you up. I think tea is always better out of beautiful china, especially the pieces that tie us to ones we love. Hope and Titus have a good day! aww so sorry to hear that you are feeling a bit blue today..
we all here to cheer you up..dont worry..
tea and biscuit are very yummyyyyy looking..love them so much.. I'm sorry you are blue but we friends that have tea together are there for one another. Earl Grey Creme is my FAV but mine is from Teavana. I must try David's Teas. Aww, I hope the tea helped you feel less blue. Glad Titus joined in too! The recipe sounds yummy! I do hope that delightful tea party cheered you up! With such a cute companion, you can't loose! What a delightful tea party you made, with some lovely decoration and China. I hope it helped you to feel a bit better. I hope Titus and the Olympics cheer you up today. Such a pretty tea. 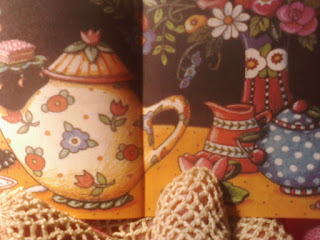 I love the idea of a tea party, it's great! I hope your visits from your fellow blogging friends helped lift your spirits, Anne. We all have days like that now and then--makes us appreciate the happy times all the more! So what stopped you making the cookies for us? LOL. I'm really enjoying all the tea parties this weekend. I didn't join in because our idea of afternoon tea is a cup of instant coffee and an apple! But I'm happy to live vicariously through everyone else. Awww, I hope hubby comes back soon and have tea with you, along with the goodies. Come to think of it, he should take you to The Secret Garden for a high tea, or even a mini high tea! I love a good cup of tea but I'm very picky when it comes to my tea, it's a good ole cup of steeped orange pekoe or nothing!